Once again, Steve Skybell's Tevye is rich and real as he avoids the trap of scenery chewing. (Beowulf Boritt's barely-there set of parchment wouldn't make much of a meal, anyway.) Under Joel Grey's actor-friendly direction, Skybell consistently goes for nuanced naturalism instead of laughs or apoplexy, and he has a lived-in chemistry with newcomer Jennifer Babiak as his anxious wife, Golde. The strong-voiced Drew Seigla as Pertshik, the Bolshevik revolutionary who woos Tevye's second oldest daughter, is another welcome addition. The rest of the returning romantic leads are as charming as ever, making sure never to cross into cloying, and Jackie Hoffman's Yente provides plenty of comic relief without succumbing to caricature. 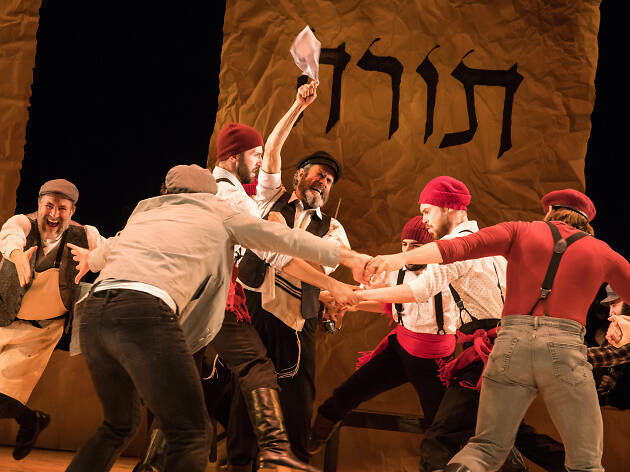 Admittedly, this may not be the most spectacularly sung, danced or designed Fiddler ever to hit the stage, but it's likely the most authentic thanks to the use of Yiddish and the focus on genuine feelings. At times it's more like a séance than a show. The turn-of-the-20th-century village of Anatevka may be fictional, but its denizens feel wonderfully, vibrantly alive. Stage 42 (Off Broadway). Lyrics by Sheldon Harnick. Music by Jerry Bock. Book by Joseph Stein. Directed by Joel Grey. With ensemble cast. Running time: 2hrs 55mins. One intermission. 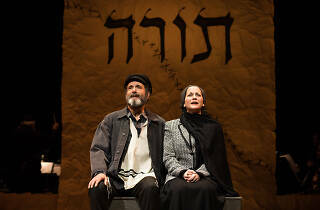 How do you make Fiddler on the Roof even more Jewish? Do it in Yiddish! Fans of Jerry Bock and Sheldon Harnick’s landmark musical about Tevye the Milkman and his shtetl community in early-20th-century Russia will go meshuga for the U.S. premiere of Shraga Friedman’s translation, which ran briefly in Israel in 1965. 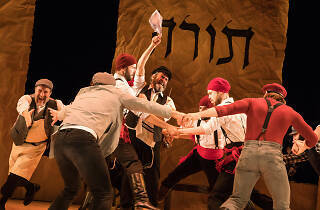 It’s a mitzvah that the century-old National Yiddish Theatre Folksbiene has resurrected this version, which lets the characters speak­ (and sing) in the expressive guttural tongue they would have used in real life—the language of the Sholem Aleichem stories that inspired the show. 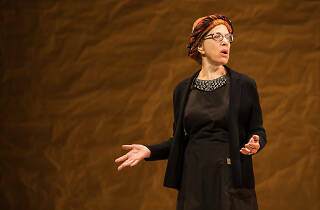 English translations are projected for the benefit of those who don’t know Yiddish, and many of the performers aren’t fluent in the language, either (they have learned their lines phonetically, much as opera singers often do). But director Joel Grey—yes, that Joel Grey—has made sure the performers know what they’re feeling, even if they don’t know what they’re saying, and their emotional journeys are so clear you may find yourself abandoning the oddly placed supertitles to luxuriate in the sound of the language and the klezmer-inflected score, played by a lively 12-piece orchestra. Of course, that means you may miss the ways this Yiddish interpretation differs from the original, as when “If I Were a Rich Man” is reimagined as “If I Were a Rothschild,” a reference to a 1902 tale by Aleichem. 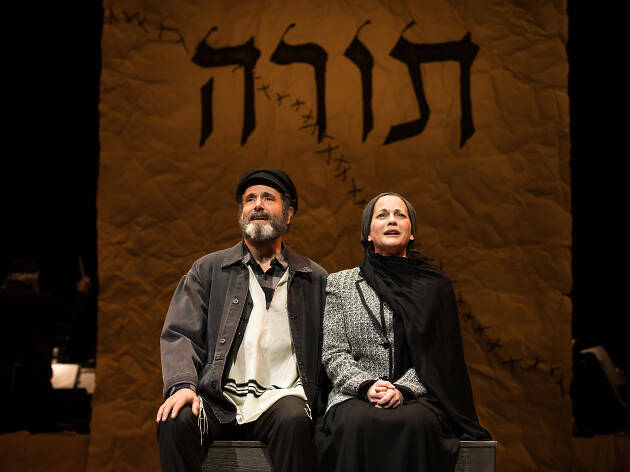 Steven Skybell, who appeared in the most recent Broadway revival of Fiddler, is a compelling Tevye whose evolution from confidence to uncertainty—as a father, as a citizen, even as a man of faith—is heartbreaking. 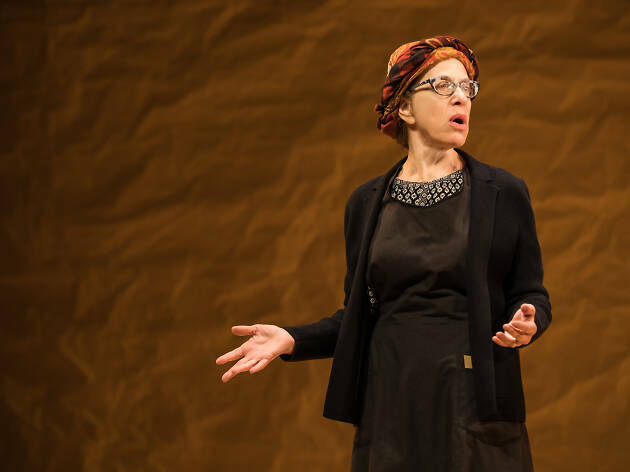 Mary Illes is solid as his nervous wife, Golde, who wants to arrange good marriages for their five daughters, and scene stealer Jackie Hoffman has audiences plotzing at every punch line as gossipy matchmaker Yente. The rest of the 26-member cast sings strongly, especially the “Matchmaker, Matchmaker” trio of Stephanie Lynne Mason, Rachel Zatcoff and Rosie Jo Neddy, and everyone handles Staś Kmieć’s re-creation of Jerome Robbins’s iconic choreography well enough. Cameron Johnson, so dreamy in Folksbiene’s The Golden Bride two summers ago, makes a winning impression as Russian suitor Fyedke. This simple, sentimental production isn’t about spectacle. The bare-bones design is dominated by a sheet emblazoned with the word TORAH in Hebrew lettering, which is torn apart and sewn back together in a powerful evocation of what the Jewish people have endured. Here’s hoping Folksbeine’s Yiddish Fiddler becomes a new tradition. Museum of Jewish Heritage (Off Broadway). Lyrics by Sheldon Harnick. Music by Jerry Bock. Book by Joseph Stein. Directed by Joel Grey. With ensemble cast. Running time: 2hrs 55mins. One intermission.